The superhero movie genre is booming. One could even argue that it is oversaturated. Comic books, where many mainstream superheroes originated, have been around for decades. Yet over the last ten years, there’s been an extreme influx of big-budget superhero movies for theater-goers to consume. Credit for much of this deluge goes to the Marvel Cinematic Universe (MCU) that began in 2007 and has put out over 20 big-budget films, with at least 11 more still in production. Marvel, along with DC Comics, is leading the fray in piling on the films for this genre. Spider-Man: Into the Spider-Verse is yet another superhero movie, but unlike some of its predecessors, it gives a fresh take on what and who a superhero is and subverts some of the overused tropes that are often riddled throughout many of these movies. And it does so in a fun, inclusive, and visually stimulating way. A Spider-Man movie is not a new idea itself. It’s been done plenty of times before since all the way back to the 1970s, both animated and live action. The popular character of Spider-Man originated in the 1960s comic books created by the late Stan Lee and Steve Ditko. The persona of Spider-Man has often been associated with Peter Parker, a young white male. 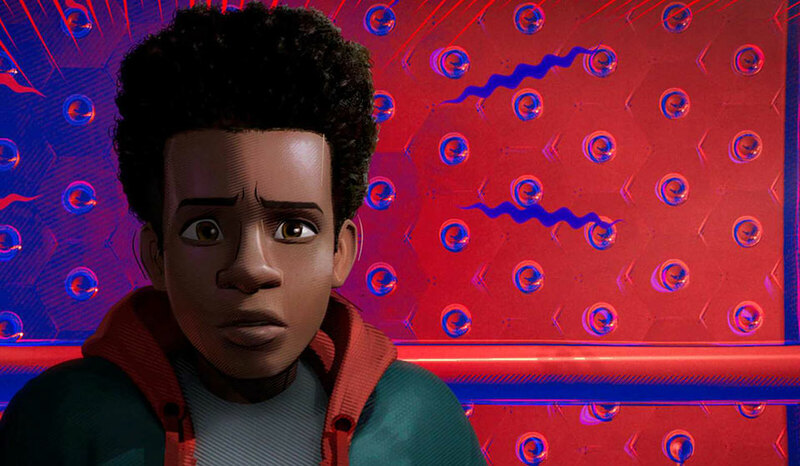 Spider-Man: Into the Spider-Verse changes that narrative from the very beginning by putting the focus on the newer persona of the Miles Morales version of Spider-Man. Miles is a young teenager of color with African-American and Latino heritage. And instead of simply having it so the only thing different about this Spider-Man is the color of his skin, the filmmakers infuse the influence of Morales’ culture and ethnicity, which ends up coloring the movie in a refreshing way through the music, design, and overall world that Miles exists in. One could argue that the look of this film is the future of animation, and perhaps even a quality alternative to live-action movies. Often, viewers rank animated films as not being on the same level as live-action ones. Spider-Man: Into the Spider-Verse makes a strong case that this kind of animated adaptation allows for space and freedom in a genre often limited by mere human capabilities. Not to mention the fact that computer-generated imagery (CGI) next to humans on screen can feel jarring and unnatural if done wrong. That’s not something to worry about in this movie. There are action sequences, city views, and fight scenes in the film that would not land as effectively if done any other format. The film’s animation is so innovative that Sony Pictures Animation, which produced it, is seeking to patent the animation process the movie employed. Every single frame of the film uses CGI as its foundation, but it follows that with an overlay of hand-drawn art. This is a far cry from the standard computer-generated animation in more recent movies of this type. The result is a less tech-heavy look that makes the film more distinct. This technique does well in bringing to life the characters which are the heart of the narrative. It puts the movie on par with any of its live-action counterparts. 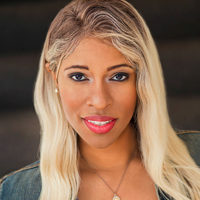 This push to put characters of color in more visible positions in the popular genre is a necessary one that reflects the diverse world we live in. It’s also a lucrative one, as demonstrated by the record-breaking Black Panther film. One of the recurring themes in Spider-Man: Into the Spider-Verse is that anyone can be a hero. 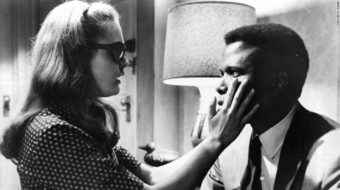 This sentiment takes on multiple meanings both within the film and in what it represents – putting a young man of color front and center during a time when intense racial division and bigotry plague our nation. Miles is relatable, and his struggle to find purpose and do right is at the heart of the story. The diverse characters around him, from his parents to Peter Parker himself, help in that endeavor in an entertaining and effective way. One might think that animation takes away from the genuineness of the characters, but this is not the case, as the performances and emotional moments land well and resonate. The pacing of the 116-minute film moves along well, without overstaying its welcome. This is also a nice change from its live-action counterparts that have come to be characterized by running times bordering on three hours or more. There’s something in the film for people of all ages, even those who know nothing about comic books or Spider-Man. There are references for knowledgeable fans, of course, but nothing that would alienate the casual viewer. The addition of a major superhero of color, in a sea of often white male personas, is a step in a more inclusive direction. That helps the growing population of Black and brown youth see themselves on screen in an epic way. Overall, Spider-Man: Into the Spider-Verse is a feel-good time at the movies with heart and a visually astounding look that many will enjoy.